What are the symptoms or signs of an Infantile Hemangioma? 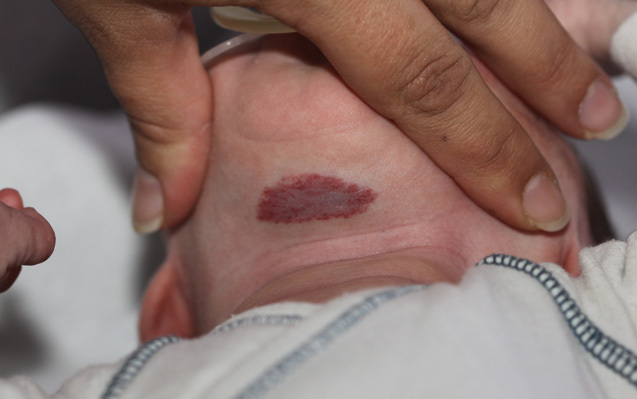 Although infantile hemangioma is not present at birth, two types of lesions were identified as possible precursors to their onset: white patch of vasoconstriction or “anemic nevus” most likely linked to local hypoxia or a red macule, telangiectatic, often with imprecise boundaries. The final volume is not predictable by the appearance of these preliminary lesions. Infantile hemangiomas usually appear days or weeks after birth. This delay between birth and growth phase is a good diagnostic tool in determining the correct diagnosis of infantile hemangioma. The growth phase is usually achieved within the first 3 months of age; but may extend to 8 months for superficial and 12 months for deep types of IH. In rare cases, growth may extend until month 24. Following growth phase, most IHs stabilize and then regress slowly over a course of months and years. In some cases these two phases overlap; while the superficial component regresses, the deep component might still continue growing. The regression is complete in 60% of cases at age 4 and 75% at the age of 7. 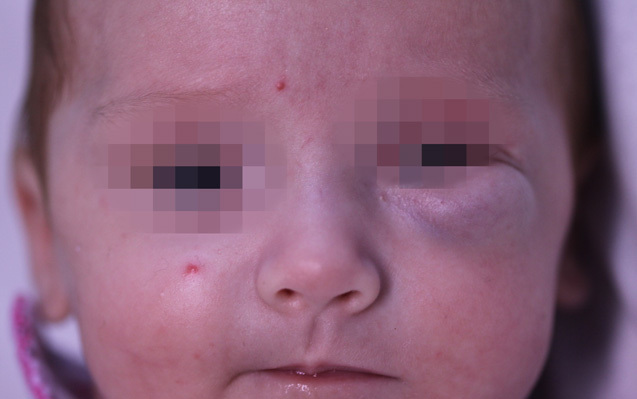 Some hemangiomas may leave fibrous fatty tissue with or without skin texture alterations, even after regression. Additional developmental anomalies have been reported in some patients with infantile hemangiomas. Two syndromes are now well identified: PHACES syndrome and PELVIS/SACRAL syndrome. The goal of timely recognition of infantile hemangiomas and therapy is to minimize or eliminate long-term sequelae. Although most tumors naturally involute, lesions can result in permanent residual changes including fibro-fatty residuum, scarring and telangiectasias. Complications of hemangiomas include permanent disfigurement, residual scarring, ulceration, bleeding, visual compromise, airway obstruction, and congestive heart failure. Click on NEXT to learn about the risks and complications of IH, and to continue on your child’s journey to better health.